The XR-10 was an experimental transport helicopter built for the US military by Kellet Autogiro. It first took flight in April of 1947. The XR-10 was designed to be a military transport helicopter but only ever flew as a prototype. Just as its XR-8 sibling did. Kellet designed the XR-10 in response to a published requirement by the US military for a transport helicopter that could move passengers, cargo and wounded within an enclosed fuselage. At this early stage in helicopter history it was typical for the interior cabin of the craft to be exposed to the atmosphere since weight had to be saved. Power to weight ratios were relatively poor at the time and therefore lift power was limited. Since Kellet had already done significant design work on the XR-8, the XR-10 inherited many design features from it. Most notable the twin meshed rotors, each driven by its own engine. This configuration would provide enough lift to allow for an enclosed transport helicopter. At least in theory. At first glance the XR-10 simply looks like a bigger XR-8, but upon closer inspection one notes that the twin engines each rest on a nacelle that drives a rotor through long shafts. Also, while the XR-8 had some fabric skin, the XR-10 was entirely skinned in metal. 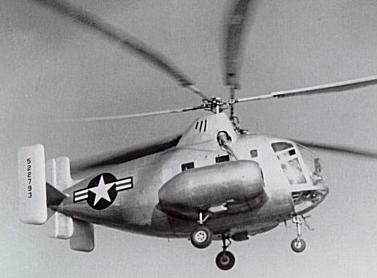 When the first prototype XR-10 first took flight, it was the largest rotorcraft to ever fly in the United States. However, the XR-10 also inherited the XR-8’s main flaw. The main rotors tended to have blade collisions. This problem was fixed, but when the first prototype had a control failure and killed Kellet’s chief test pilot, the project was abandoned. Do you want to comment the Kellett XR-10 helicopter?